If we all had our way, our homes would be a lot friendlier to the environment. More often than not, however, we’re stopped by the initial costs of doing so, as in the case of installing solar panels. Still, that doesn’t change the fact that solar panels go a long way in helping the environment. The economic benefits alone of having solar energy power your home should be more than enough reason to go for it. Sure, you’re likely to spend a lot of money having them installed, but the savings in electricity bills and the reduction of your dependence on the local grid will be more than enough to make up for it. 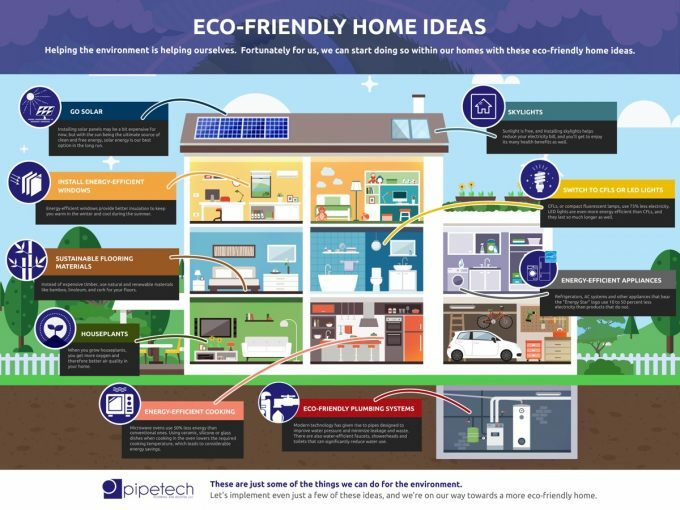 Making your home-eco-friendly is also more than just being friendly to the environment and getting energy bill savings. Letting in more natural light through a sunroof, for example, has a positive impact on your overall health, as sunlight brings with it many health benefits. The same goes for using only sustainable materials when building or remodelling your home. As you can see, being eco-friendly is also being friendly to ourselves. Whatever the costs, we should keep in mind that everything is for our own good. If you need more eco-friendly home ideas, check out the infographic below from New AC Unit.